The Corbin Technical Bulletins, Volume IV, was first published in 1987. 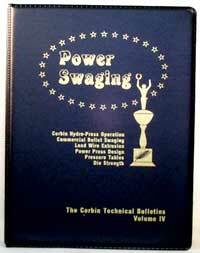 It was the first of the technical bulletins to be dedicated to a single subject, so it was named "Power Swaging". At that time, Corbin had developed the famous Hydro-Press, now the standard for custom bullet makers around the world and basis for over 450 commercial enterprises. But other products had evolved as well, and the experimentation, formulae, engineering and math involved is discussed in this book. Die strength, press design, hydraulic and mechanical systems, air (pneumatic) presses, and more, are discussed in detail. This is the first technical bulletin series to be re-written to reflect changes in design of Corbin products, and is the standard operating manual for the Corbin Hydro-Press and long-discontinued Hydro Junior. The current version was just published and contains updates to earlier work. It is a 6-inch by 9-inch 3-ring bound work with additional inserts, tables, and photos. Cat.No. TB-4. Also available on CD-ROM in e-book form as TB-4-E.